Holly trees are susceptible to a variety of different fungal infections that attack different parts of the holly tree from leaves to roots. Plant vigor greatly decreases and infections may progress until the entire plant dies, particularly when root systems are destroyed. Identify different holly tree fungus problems and associated control methods for successful growth of healthy holly trees. Holly tree fungus problems are more prevalent among stressed or weakened plants. With proper maintenance, your holly trees remain vigorous and more prepared to fight off or to resist fungal infections. Grow hollies in full sun exposure; though hollies will grow in full sun to partial shade, plants grow most successfully in full sun. Provide acid, well-drained soil high in organic content, according to the Clemson University Extension. Add a layer of mulch to the soil surrounding your holly tree for moisture retention and to regulate temperatures; mulch reduces the occurrence of weeds that act as host plants to insects that may infest trees and cause injury. Black root rot is a disease of holly trees caused by the soil-borne fungus Thielaviopsis basicola. Symptoms of this fungal infection includes stunted growth and color fading in veins. Roots become a dark brown to black hue. Black root rot primarily attacks root systems, causing overall discoloration and rot. If the damage becomes too severe, plants may die, particularly in times of drought conditions during which the plant has no means of absorbing water, according to the Clemson University Extension. For control, remove affected plants as fungicidal application will not cure black root rot of holly trees. Since the soil-borne fungi may remain in the soil for many years, plant resistant hollies or other resistant plants. Tar spot is a fungal disease that attacks holly trees. Caused by the fungus Phacidium curtisii, symptoms include yellow spots on leaves during May. Affected leaves become a red/brown color and turn completely black by autumn, according to the Clemson University Extension. As water often spreads fungi from one plant part to the next, heavy rainfall may cause fungal infection of berries that subsequently display similar spots. Tar spot specifically affects English holly trees and American holly trees. For control, remove and destroy all affected fallen plant parts to prevent re-occurrence and transfer of the disease to other plants. Remove and destroy severely diseased leaves still on the tree and prune your holly to thin out branch density and increase airflow to all branches. Always sanitize pruning tools between each cut and between uses from plant to plant to prevent the transfer of disease-causing fungi. Phytophthora root rot of holly trees is a caused by a water mold fungus called Phytophthora cinnamomi. This root rot disease causes yellowed leaves that may fall prematurely from the tree, slow or stunted growth, twig dieback, wilting, and areas of dead plant tissue that usually extend from roots to diseased limbs. The disease progresses until the root system is completely destroyed, causing potential plant death, according to the Clemson University Extension. For control, avoid excessive mulch use as the water-borne fungus prefers wet sites and poorly drained soil. Consider planting trees in raised beds for better drainage and utilize only well-drained soil in areas that allow for cool soil temperatures. Choose healthy holly trees for planting to avoid growing an already diseased plant. For preventive fungicide use, apply fungicides containing the active ingredient etridiazole or mefenoxam. Fungicides may prevent disease but will not cure a problem once it has infected your holly. Contact a professional for successful application, according to the Clemson University Extension. Identify resistant and highly susceptible varieties as a preventive measure to avoid holly tree fungus problems. For example, Chinese holly (Ilex cornuta), Yaupon holly (I. vomitoria) and American holly (I. opaca) all exhibit moderate resistance to black root rot, according to the Clemson University Extension. Japanese holly (I. crenata), however, is highly susceptible to root rot like black root rot and Phytophthora root rot. 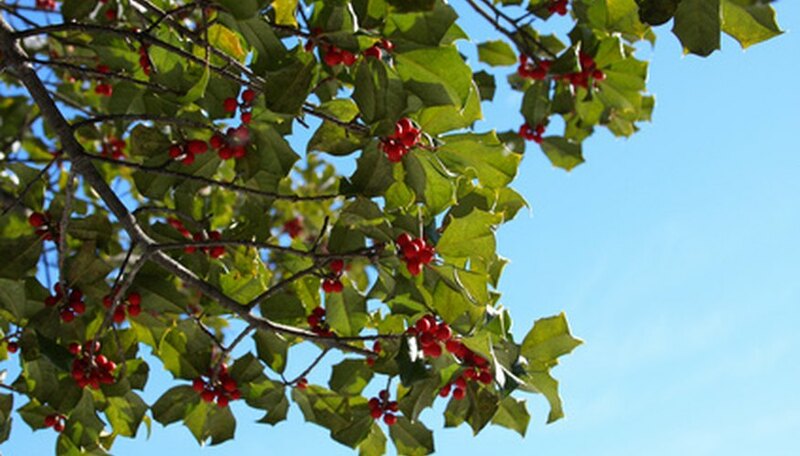 For a detailed account of resistant and susceptible species as well as which holly fungus problems are prevalent in your region, contact your local extension agent.